If you are going to read this blog, it’s only fair to tell you how I’ve done historically. 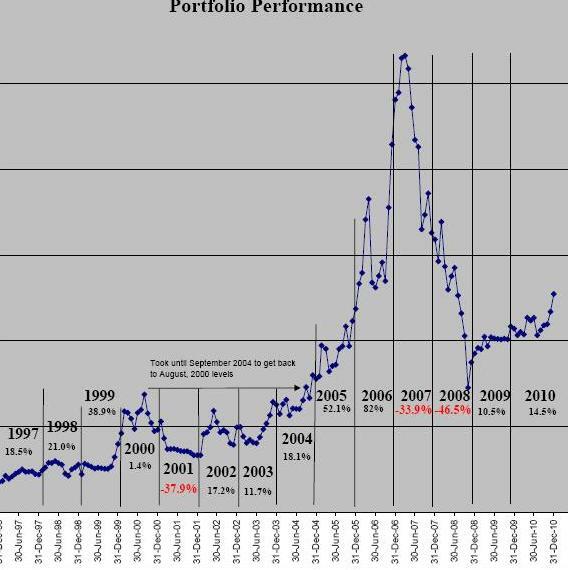 Attached below a chart showing the actual performance of my portfolio from 1996 to December 31, 2010. (The percentages are actual, but I have deleted the dollar values, since I don’t really want the entire world to know the actual value of the portfolio). (Click on the chart to enlarge). The chart teaches us many interesting lessons. First, JDH has no clue what he’s doing. For example, the portfolio reached a peak in August, 2000, at the height of the dot.com boom. Rather then gradually taking money off the table as the portfolio grew, I got greedy, and paid the price. The portfolio fell, registering a loss of almost 38% in 2001. In hindsight, there is no excuse for a portfolio falling by 38% in one year. Stocks begin to break-down, and once they do, it’s time to start selling. I look at this chart at least once a month as a reminder not to be that greedy, and that stupid, again. As the chart shows, it took me until September 2004 to get back to where I was in August 2000; that’s four wasted years. So, what happened in 2007 and 2008? The chart looks like a repeat of 2000 and 2001, doesn’t it? So much for learning from my mistakes. The all time high was reached in March, 2007, and by the end of October, 2008 the portfolio has fallen by 73% from those peaks. Obviously cash should have been taken off the table a lot sooner than it was. The portfolio declined by 33.7% in 2007, and an astounding 45% in 2008. Most of the 2008 loss occurred during the crash in the period from July through October, 2008. November 2008 through January 2009 were up months. Stated another way, at the end of February, 2009 my portfolio was back to where it was in July, 2005. How’s that for three and a half wasted years? The problem, of course, is that I earned 52% in 2005, and 94% in 2006, so I thought I was invincible. I wasn’t. I was simply an investor in a bull market, when any idiot can through darts at a dart board and make lots of money. 2008 proved to be much more sobering. In a bear market, everyone, except the truly brilliant (or lucky) who were in cash, or were short, lost money. In 2009 and 2010 I paid much more attention, not to profits, but to protecting against losses. I take profits when they are there; I try not to be greedy. Am I holding more cash until it is more clear that a bottom has been reached. And I will try not to make 2009 a repeat of 2001, or 2007 – 2008. In 2010 I was largely in cash for the first three quarters of the year. In hindsight, I should have been fully invested, but as you can see from my history of big losses, capital preservation was my primary goal. At the end of 2010 I was back to where I was in July, 2008 (and January 2006). How’s that for five wasted years? Obviously history repeats itself, so I need to keep looking at this chart as a reminder.